When James M. Orent says of Bruch’s Symphony No. 3 in E Major, “It’s one of the most beautiful things I’ve ever heard, and I’ve been involved with music my entire lifetime,” you get a sense of how wonderful will be this Sunday's concert. This begins my seventh season as Announcer/Master of Ceremonies ("Voice of the Symphony") and also my tenth year of writing, narrating and producing radio commercials for the magnificent Brockton Symphony Orchestra. Thanks to the Enterprise of Brockton for publishing this interview. Note: The two images below are from the Brockton Symphony's web site and were not included in the article. BROCKTON – The Brockton Symphony Orchestra will begin its 67th season Sunday with a performance at Oliver Ames High School in Easton. 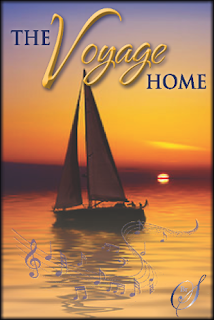 The show, which will follow the season’s theme of “The Voyage Home,” will start at 3 p.m. and include music from Germany, Scandinavia and the British Isles. The concert starts at 3 p.m.
Called “Rhine Journey,” the show is the first of the season’s five concerts and will showcase four works: “Oberon Overture” by Carl Maria von Weber, “Kol Nedrei” by Max Bruch, “Cello Concerto No. 1 in C Major” by Joseph Haydn, and after an intermission, “Symphony No. 3 in E Major’” by Max Bruch. The evening will also feature cellist David Shin, a Yale University student and 2012 Feinberg Competition finalist. 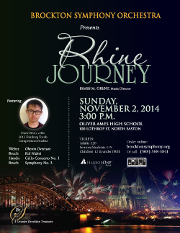 Orent only knows of the hidden gem because he was poring over catalogues for works that would fit with the concert’s “Rhine Journey” theme. He described the symphony as “magical,” and was taken by the piece’s second movement. “It’s one of the most beautiful things I’ve ever heard, and I’ve been involved with music my entire lifetime,” says Orent. He polled his colleagues at the Brockton Symphony and the Boston Pops. Not one of them knew the piece. But there’s really no rhyme or reason for why fantastic works aren’t played anymore, Orent says. “Things move in cycles in symphonies, just like everything else.” The 66-year-old Brockton symphony features local professional musicians who perform several shows each year, usually at local schools. The symphony’s second performance will be a “Holiday Pops” concert Dec. 7 at West Middle School in Brockton. Tickets for the Nov. 2 concert are $20 for adults and $15 for seniors and students. Because ticket sales cover only 20 percent of the concert expenses, donations are also welcome. To purchase tickets or make a tax-deductible donation, please visit: www.BrocktonSymphony.org. All shows start at 3 p.m.